In Port Meadow near the car park on the the Godstow Road. 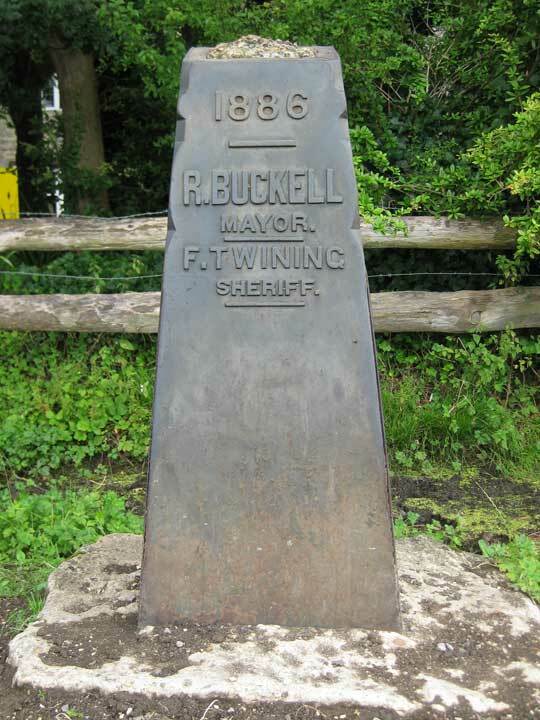 Robert Buckell was Mayor of Oxford for the first time in 1885/6, and Francis Twining was Sheriff. The halt was only a short one, however, and the civic peregrination was resumed to Port Meadow, following the ditch which divides the famous open space from Wolvercote Common. When the boundary stone was reached it was discovered that it had been overthrown. Standing by it were a party of 40 to 50 residents of what was then Wolvercote village. They included the Vicar and another gentleman in clerical attire. The Vicar protested to the Mayor against the procession walking on the Wolvercote side of the ditch. The Mayor replied, somewhat brusquely, that it might be imagined he knew nothing about the question. While the police were “endeavouring to prevent anything in the nature of a struggle” the mace and flag were placed on the stone “amid cheers” and the flute and drum obliged with a rendering of the National Anthem. The unnamed cleric with the Vicar was, however, roughly handled; we are informed that “his tall silk hat assumed a concertina shape” and he laid about him with his umbrella in self-defence. He was doubtless regarding his battered headgear when the procession moved off to a marquee which had been erected for lunch nearby to the strains of “See the Conquering Hero Comes”.